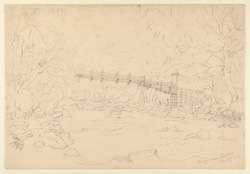 Pencil drawing by Sir Henry Yule (1820-1889) of a wooden bridge over a river at Barkot in Himachal Pradesh, dated between 1840 and 1862. The image is inscribed on the front in pencil: 'Bridge near Burkot. May 31/.' Sir Henry served with the Bengal Engineers in India from 1840 to 1862. In 1843 he was sent to the Punjab to work the canals on the west of the Jamuna river. From 1845 to 1849, he worked in the North West Provinces with a group of brilliant young engineers, restoring and developing the old Mughal irrigation system. Work on this project was interrupted by the First and Second Sikh Wars (1845-6 and 1848-9) in which Sir Henry participated. From 1855 until his retirement he was Under-Secretary then Secretary of the Public Works Department for the Government of India, and was largely concerned with irrigation works, roads and railways. He is perhaps best known for his work on the 'Hobson-Jobson' (London, 1886), a glossary of Anglo-Indian colloquial words and phrases.